Any holidays in kindergarten for a long time remain in memory of children, so you should try to approach the organization of these events very seriously. Every step and every action it is advisable to plan well and time your swing, be sure to keep in mind that there may be some unplanned situation. Must-have "freedom of maneuver", a small margin of time and be prepared for the fact that something doesn't go according to plan. The child may act up, someone forgot the words, someone does not want to dance - these things are certainly not very positive impact on the overall mood, but to do from this tragedy is not worth it, these things happen regularly and an experienced teacher will always find a way to calm cranky kids and return them in a General holiday. Preparing for graduation in kindergarten, holiday entertainment or a Christmas party has many common points that can simplify this process. Various scenarios for the timing and essence of events in kindergarten is to collect and analyze for the future. There are many little things that seem simple and obvious, but which can seriously affect the party. Take, for example, the process of dressing children in costumes. 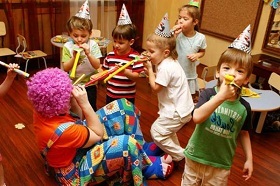 If in advance not to find out whose parents would not be able to attend the party and help children in dressing up, you can be in a very bad situation when the majority of children entangled in the suits and lose them some parts, and you (teacher and nurse) is not able to quickly resolve the complication.